Porsche and Audi are hoping to challenge Tesla in the luxury electric car market, but Elon Musk can sleep easy for now. Both are still years away from production. Porsche unveiled its first all-electric concept car at the Frankfurt auto show Tuesday. It looks like a futuristic version of the Porsche 911. The German sports car maker boasts that the four-door Mission E will be able to drive roughly 310 miles on a single charge. The new model should take just 15 minutes to charge to about 80% of its capacity. That would be significantly faster than market leader Tesla (TSLA), which requires about 30 minutes to reach the same level of charge. Plus, the Mission E boasts a longer range than Tesla's Model S. It should run for 250 miles after a 15-minute charge versus 170 miles from a 30-minute charge. Still, Tesla has a few years to close that gap. A Porsche spokesperson told CNNMoney that production of the car would be "feasible within the near future," but noted that it may take five years for battery technology to advance sufficiently. 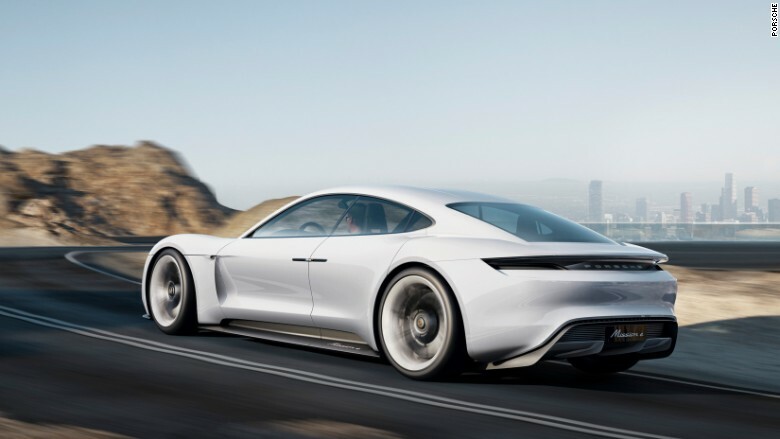 Porsche's Mission E concept car is an electric, four-door vehicle that could go head-to-head with Tesla's Model S.
The concept is part of a bigger push by Porsche parent Volkswagen (VLKAY) into electric vehicles. VW CEO Martin Winterkorn said the group is planning to roll out 20 more electric cars and plug-in hybrids by 2020. "No commitment to electro-mobility can be any clearer than that," said Winterkorn, who oversees brands including Audi, Bentley, Lamborghini and Bugatti. Audi unveiled a new all-electric SUV concept vehicle called the e‑tron quattro last month. 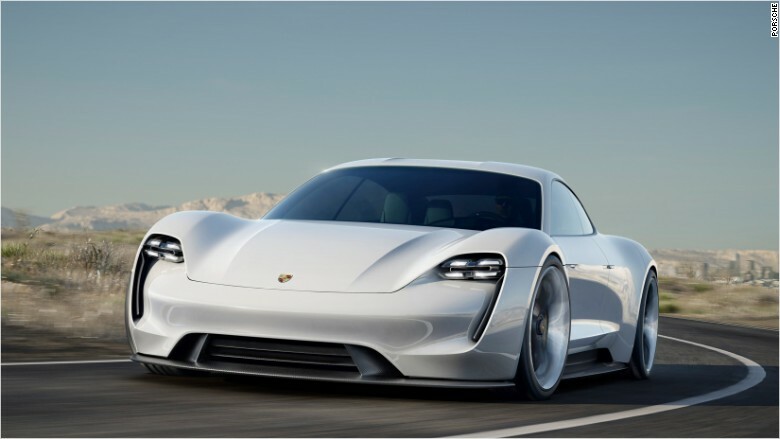 It will have the same driving range as the Porsche Mission E, and production will begin in 2018. The Mission E will offer features such as gesture-activated controls, eye-tracking controls and some holographic images around the dashboard. 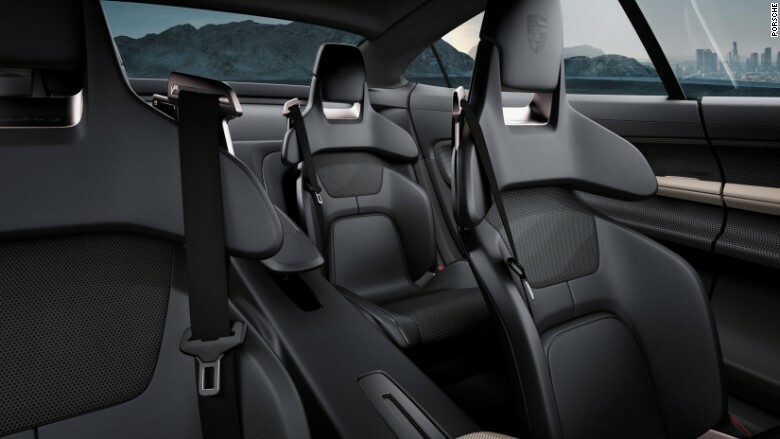 The interior of the Porsche Mission E concept car. Unlike its competition, the car can also be charged wirelessly. Porsche said drivers will be able to park over a coil embedded in the floor of their garage and energy will transfer to the battery without cables. And you can't talk about Porsche without talking about speed. The car should go from zero to 60 in under 3.5 seconds. The Porsche Mission E concept car.